BAMBOO Jewelry designs are colorful celebrations of nature, art, and science. Each piece of jewelry is handcrafted using a foundation of sterling silver on which fine braided wire separates cells of color, and on which metallic powders, when fired in a kiln, transform into luminous glass. With so many BAMBOO Jewelry designs inspired by endangered wildlife and because of our concern about global warming, we do everything we can to operate as a green company. Our website hosting company uses 100% renewable energy. 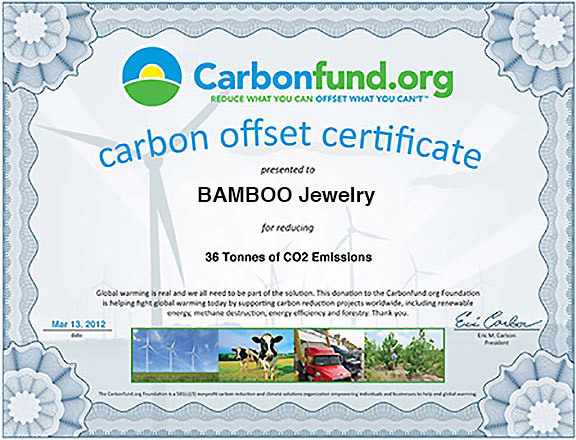 In 2007, we decided any environmental impacts we couldn't reduce to zero we'd offset with carbon credits, making BAMBOO Jewelry the world's first carbon neutral jewelry company. Nearly all the silver in our jewelry is recycled, and our goal is to use 100% recycled silver. We work in an energy efficient building which we plan to convert to solar power in the near future. We utilize compact fluorescent lights in our offices and use fans instead of air conditioning. We ship our jewelry in boxes made from recycled paper and have switched from plastic tape to paper tape to seal our boxes. The film we use for shrink wrapping is a nontoxic biodegradable bio-plastic instead of petroleum based plastic. We minimize our use of paper, and the paper we do use is recycled. We have several duplexing printers and copiers so we can print on both sides of a sheet of paper, and we recently purchased a Xerox solid ink printer which, for every 100,000 printed pages, generates only five pounds of solid waste compared to 157 pounds produced by a typical color laser printer. Every piece of BAMBOO Jewelry comes packaged in an eco-friendly bamboo gift box lined with anti-tarnish fabric. Bamboo, though harder than oak or maple, is actually a fast growing grass which can be harvested every three to five years. The bamboo used for our gift boxes is plantation grown without the use of irrigation, fertilizers, or pesticides; nor is it a food source or habitat for endangered pandas. Because of fabrication difficulties, most cloisonné jewelry rarely blends two or more enamel colors within a single wire-framed cell. BAMBOO Jewelry designs, however, often use multi-color blending to depict three dimensional contours and for realistic shading. It is also uncommon for cloisonné color cells to be created using fine braided wire, but at BAMBOO Jewelry we insist on using this intricate fabrication method for every piece of our jewelry. In addition, all our jewelry is enameled on its backside—a process known as counter enameling. Counter enameling minimizes tarnishing, strengthens pieces, and enhances appearance and is not usually found on cloisonné jewelry in BAMBOO’S price range. These are just a few examples of how BAMBOO Jewelry is striving to set new standards of excellence for sterling silver cloisonné jewelry. Steve King is a fifth generation Californian (his great-great grandfather emigrated from the Azores and lived to be 114) with degrees in Art and Environmental Studies from Yale. Steve's love of nature in general and whales in particular has led him to work as a scuba instructor and to organize a dozen whale watching expeditions to Baja, Mexico. Steve has also helped build several life-size whale sculptures, and he conceived and worked as a producer on the first hour-long, prime-time documentary about blue whales that aired on ABC and which won an Emmy for its cinematography. Christine Gonsalves, a graduate of U.C. Berkeley with a M.A. in sculpture, established and co-owns the popular Whales & Friends gift shop in Alameda, CA. She has successfully managed Whales & Friends for over 20 years. Loyal store patrons frequently comment on her talent for finding intriguing and well designed products. Christine has a special passion for cats, orchids, art, and nature. She spends most days in the company of her two beloved Tonkinese cats, Carson and Sagan, who commute from home with her to the Whales & Friends and BAMBOO Jewelry offices. Christine comes from a family of entrepreneurs.